This thrilling account of a 16th-century voyage across the top of Russia also excels at describing the birth of the modern company, says Mathew Lyons. The recent media coverage of the discovery of Sir John Franklin's flagship, the HMS Erebus, on the sea floor in the Canadian Arctic Archipelago is a reminder of the public's abiding fascination with the Age of Exploration and of its huge cost, in terms of both blood and treasure. Neither the Erebus, nor HMS Terror, the other ship under Franklin's command, had been seen since 1845. With this in mind, James Evans's book, Merchant Adventurers: The voyage of discovery that transformed Tudor England, seems particularly timely. Franklin and his men were among the last to perish in the centuries-long quest for a North-West Passage over the top of the Americas to the rich markets of the east, and in particular to China, or Cathay as it used to be known. While many books have been written about that quest, Evans has, quite literally, gone in another direction. At the heart of his book is a 1553 voyage, seeking to find a north-eastern route to China over the top of Scandinavia and Russia. It is one of the great untold tales of English exploration. Three ships sailed out of London on 10 May that year, led by Sir Hugh Willoughby, a soldier of great character but precious little knowledge of the sea. More vital to the expedition's success was its pilot – and also captain of the largest ship – a young man fully versed in the nascent science of navigation named Richard Chancellor. A year later just one ship returned. It was Chancellor's. The three ships had become separated by a storm and no one then knew the fate of the others. Chancellor, however, had travelled inland to the court of Ivan the Terrible, initiating the first contact between England and Russia. It was, says Evans, in some respects a model for how England – and the future East India Company - would create an empire. As for Willoughby, he and his men would die trying to see the winter out. Their bodies were discovered perfectly preserved on board their ships by Russian fishermen the following year. It is often said they froze to death, although Evans persuasively argues that they may have died from carbon-monoxide poisoning as a result of burning sea-coal inside. Where Evans triumphs is in the breadth of his interest: the story of the 1553 voyage is superbly told, drawing on Willoughby's surviving logbook and accounts given by Chancellor and his men on his return. But, unusually for a maritime historian, Evans also has much to say on the less viscerally exciting material - the formation, structure and financing of the Muscovy Company and more generally on the economic climate that made it an attractive investment. It is hard to say which he excels in most. The Muscovy Company was the first joint-stock company in England. As such, Evans argues, its importance is hard to overstate. On previous international trading ventures, merchants might have come together to fund a voyage; their shared interest was strictly limited and any goods their individual factors bought and sold were always held separately. But the incorporation of the Muscovy Company allowed no individual trading. All stock was held in common. Investors were asked to buy shares not just in the voyage, but in the ongoing trade it was intended to spawn. The company would exist in perpetuity. It was certainly an innovative and influential model for England, although, as Evans notes, it seems to have been based on existing business practices in Italy. It was also immediately successful: the company quickly found 240 investors at £25 a share. Evans brings all this to vivid life: not merely the courage of the men who risked and often sacrificed their lives at sea, but also the ferment of political, economic and intellectual life. Importantly, he shows these great endeavours not merely as enterprises but first and foremost as ideas, as projects that grew of the new sciences of cartography and navigation, out of the daily reality of the world's map being redrawn, and of the need for men of commerce to adapt their own practices to these bewildering, exciting developments. In that sense, the subtext of the book might be seen as the battle between traditional thought - the supposed givens of trade and travel – and newer empirical approaches. In their different ways, all these men are battling to find a way forward at what Elizabeth I called the unknown limits of the world. 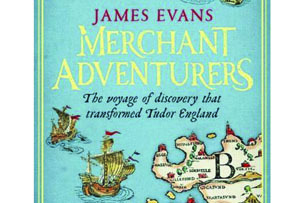 Merchant Adventurers: The voyage of discovery that transformed Tudor England by James Evans is published by Weidenfeld & Nicholson at £25. Can we avert another financial crisis?